Despite claims that the consumption of sugary drinks may lead to an estimated 184,000 adult deaths each year worldwide, the soda industry is still a $75-billion market. Nearly half of Americans drink at least one soda every single day, in spite of all we know about the negative health effects of this indulgence. Of course, many of us think we’re getting off the hook by opting for a diet soda instead. After all, it’s the sugar that’s the problem isn’t it? Unfortunately, although sugar causes a whole host of health issues, it’s not the only nasty ingredient lurking in carbonated beverages. No, that’s not a typo. Diet sodas have actually been shown to lead to weight gain. A study, listed by the American Diabetes Association, has shown a link between consuming diet sodas and having an increased waist size. In fact, those who drank diet sodas actually had a waist size of up to 70% greater than non-drinkers. What’s really shocking is that those who enjoyed two or more diet sodas per day had a waistline of up to 500% greater than those who didn’t drink soda. It’s no wonder soda has made the list as one of our top Metabolism ‘Death Foods’! This visceral fat around the middle of our body is really not healthy – it’s been linked to metabolic issues and an increased risk for cardiovascular disease and type 2 diabetes. In women, it is associated with breast cancer and the need for gallbladder surgery. Instead of sugar, manufacturers load up diet drinks with aspartame and other artificial sweeteners to give that sugary taste without the calories. The problem is that these sweeteners can be more deadly than actual sugar. Did you know that aspartame is one of the most controversial FDA approvals in history? So far, over 10,000 complaints relating to this sugar replacer have been filed. What’s really worrying is the FDA’s own admission that less than 1% of those who experience a reaction to a product ever report it. The real number of aspartame related problems could be closer to one million. Over 90 side effects have been linked to this dangerous additive, ranging from headaches, chronic fatigue and depression to cancer and seizures. While certain soda companies have said they will drop this genetically modified sweetener from their products, it’s merely going to be replaced by another, newer sweetener called sucralose. It’s not yet known what negative side effects this will bring. Even though it may say ‘caramel coloring’ on the can, don’t be misled. Your favorite colas are not, in fact, filled with sweet and sticky caramel. The dark color of these drinks is manufactured by heating ammonia and sulfites to form compounds which are known carcinogens. Tests have shown that high doses of the chemicals in this coloring cause tumors on the liver, lungs and thyroid of rats and mice. Naturally, chemicals that cause cancer in animals are considered to be a threat to humans too. In 2012, the Center for Science in the Public Interest estimated that 15,000 cancers could be caused by the levels of 4-MeI currently found in drinks. Shortly after, Coca-Cola announced it would be changing its formula to include lower levels of these carcinogens, although the additive wouldn’t be removed completely. Unnecessary toxins in any amount should be a cause for concern. Sodas, even the diet ones, may contribute to osteoporosis – or brittle bones. Right now, more than 10 million Americans have osteoporosis and about half of women aged 50 or more will suffer at least one osteoporosis-related fracture. One easy way to reduce your risk of injury is by quitting your soda habit. Researchers found that women who regularly drank cola-based sodas had almost 4% lower bone mineral density in their hips, even though calcium and vitamin D intake were consistent. The results were similar whether it was a diet soda or the ‘real deal’. Interestingly, women who drank non-cola soft drinks didn’t appear to have lower bone density. 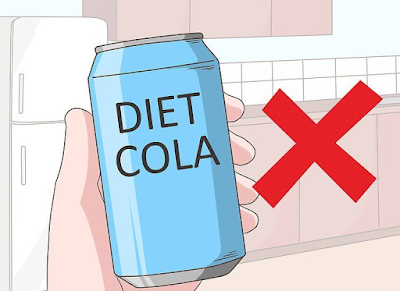 But don’t let that encourage you to simply switch to another flavor – keep reading for other diet soda related issues that aren’t confined to colas! Those who regularly drink from cans and plastic bottles are at risk of exposure to BPA (Bisphenol A). This industrial chemical, which can seep into food or beverages from containers, is a health concern because of possible effects on the brain, behavior and prostate gland of fetuses, infants and children. Chronic exposure has been associated with heart disease, cancer and other health problems. A recent study, outlined by the New York Times, is among the first to show that a single exposure to the chemical can have a direct and immediate impact on cardiovascular health. BPA was found in the urine of participants within two hours of exposure, and blood pressure levels also rose dramatically within the same time period. Repeated exposure over time could cause hypertension (high blood pressure), something which 30% of Americans already suffer from. The safest thing is to avoid BPA lined cans – and the sodas that come in them! Always look for BPA-free plastic bottles or, better yet, choose glass. The phosphoric acid found in soda has been linked to heart and kidney problems, muscle loss and osteoporosis if taken in too great a quantity. Found in both regular and diet soda, this chemical is added to drinks to preserve their shelf life but it might just shorten yours! A study has shown that the excessive phosphate levels found in sodas caused lab rats to die five weeks earlier than rats with more normal phosphate levels. Did you know that drinking large quantities of diet soda could be as damaging to your teeth as methamphetamine and crack cocaine use? Shocking research has shown that the oral damage caused by soda shows striking similarities that of long term drug abuse. While the soda drinker in this study consumed 2 liters of diet soda every day for up to five years, other research has shown that, even when soda is consumed at low levels, tooth enamel erosion can occur. In the second study, all five sodas tested caused oral damage, due to their pH levels. With US dental care expenditure reaching $111 billion in 2012 (a decline from pre-recessionary times), it begs the question: Why do we spend so much on dental care, when we continue to consume products that we know actually cause our teeth to decay? A massive US research study carried out in 2013 of over 250,000 people found depression was more common among frequent consumers of artificially sweetened beverages. Although researchers didn’t say what caused this link, it may well go back to the controversial additive aspartame. A study last year found that just half of the FDA’s maximum acceptable daily intake of aspartame could cause serious neuro-behavioral issues in otherwise healthy adults. Participants were found to suffer from irritable moods, depression and poor cognitive performance. What’s more, a 1992 study on aspartame’s effects on those with a history of depression had to be stopped early because of the severity of some patients’ reactions! The American Diabetes Association lists diet sodas among the drinks considered safe for people with diabetes and recommends them over regular sodas. However, consumption of diet soda at least daily has been associated with significantly greater risks of metabolic syndrome and type 2 diabetes, although researchers don’t know for sure if the soda actually causes the diabetes. Furthermore, researchers have found that artificial sweeteners – like those found in diet sodas – can cause high blood sugar levels by disrupting the healthy bacteria in the gut. High blood sugar levels can be a precursor to diabetes. Play it safe, and look for other alternatives to diet sodas and artificially sweetened beverages. While a solid cause-effect relationship hasn’t yet been established between diet soda consumption and cardiovascular risk, several studies have indicated a link between the two, which should give cause for concern. A study of 2,500 New Yorkers over 10 years found that daily diet soda drinkers were more likely to have a stroke or heart attack, or die from vascular disease. Even after researchers accounted for smoking, exercise, weight, salt intake and cholesterol levels, the increased risk remained. As previously mentioned an association has been found between diet soda consumption and type 2 diabetes and metabolic syndrome. These are two conditions that greatly increase the risk of having a stroke or heart attack. Of course, BPA exposure and high phosphoric acid intake are also linked with poor heart health – meaning a diet soda habit can impact the heart on many levels. A study listed by the National Kidney Foundation has claimed that drinking a lot of sugar-free beverages or other carbonated soft drinks might have negative effects on kidney health. Over 3,200 female nurses participated in the study, which took place over 20 years. At the beginning all had a healthy kidney function. By the end, kidney function declined by around 30% in women who drank two or more diet sodas a day, compared with those who didn’t drink soda. While the Kidney Foundation says more studies will need to be carried out to verify these findings, they also suggest water may be the best thing to drink in the meantime! You probably didn’t think that by drinking diet soda, you’d be polluting the water supply. Yet in a test analyzing 19 US drinking water treatment plants (which serve over 28 million people), it was shown that artificial sweeteners have made their way into our water. The sweetener sucralose (an aspartame alternative) was found to be present in the source water of 15 out of the 19 treatment plants, the finished water of 13 plants, and in 8 out of 12 water distribution systems. It’s pretty disturbing that something we drink can pass through our bodies untouched, and then pass through someone else’s body, also untouched! It also may have effects for plants, as it has been suggested that these sweeteners can harm a plant’s ability to perform photosynthesis, which would see plants unable to reproduce. This could have devastating and far-reaching consequences on the food chain. Diet sodas are pretty much devoid of nutrients – they have no fat (healthy fat or otherwise), no carbohydrates and no protein. They are also lacking in fiber, vitamins and minerals. So why take a chance with all these potential risks when there is nothing to gain from having a can of diet soda? What Can I Drink Instead? You could be drinking water instead, which brings several health benefits to your brain, skin, muscles, kidneys and gastrointestinal tract. Fruit or herb infused waters. Probiotic rich Kombucha or Kefir, which can help improve your digestion, skin, mood and weight. Delicious young Coconut Water – an electrolyte rich, health enhancing drink. Matcha Green Tea, a powerful superfood consumed for over a millennium in Japan.